This is another update (with October's data) to the series of posts on US price level trends that started with Price Deflation Today versus the Great Depression and Post-1990 Japan — Comparative Charts (which had data through July). The original post contains the most in depth discussion of the comparisons between the three episodes, so please look at that if you have not already. I'm posting updated charts as the data is released each month, but for now since time is scarce I will keep the commentary minimal... I will have more to say if and when the current price level trends change more significantly. 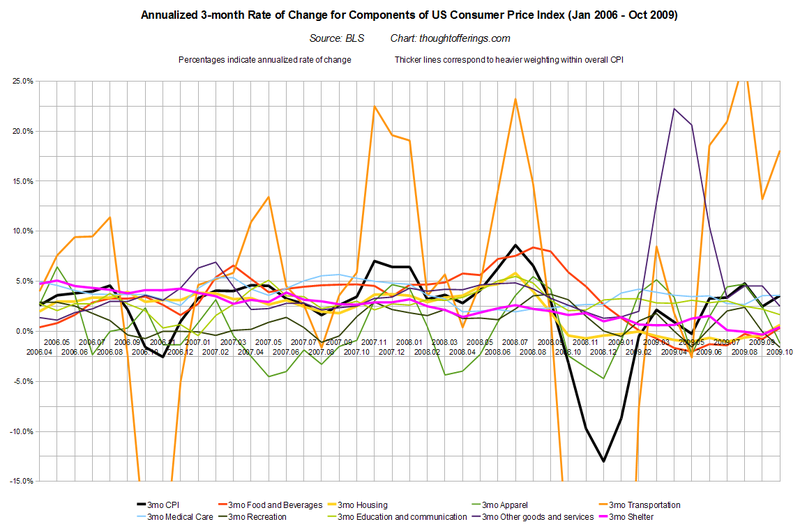 October shows a minor increase in price level for many components of the CPI. 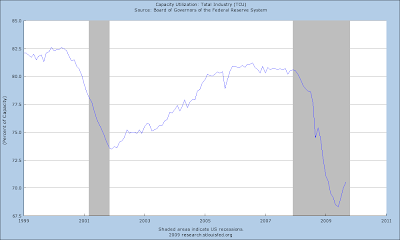 According to the BLS much of this is energy and auto related, but while disinflation is still apparent when looking at 2009's trend, strong deflation has yet to reappear in any CPI components. The big question is if and when this will change. While I expect it will, time will tell. The various measures are often somewhat correlated but they only track to each other loosely. 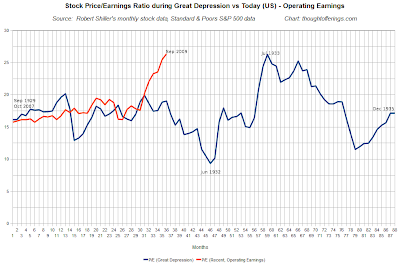 In the Great Depression prices fell faster than wages, yet wages (along with asset prices) still fell enough to propagate the adverse feedback loop of debt deflation in which income falls but debt obligations remain at the same nominal level, increasing the burden of the debt. Deflation in asset prices (triggered by the bursting of debt-financed asset bubbles) generally precedes the other deflationary trends. 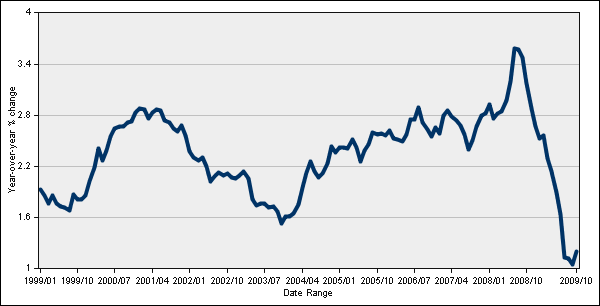 Apartment Rents "Plunge" in the West — The BLS rent measure still seems to lag reality. More on Falling Rents — The rental vacancy rate is at record levels, pressuring rents and ultimately home prices lower. 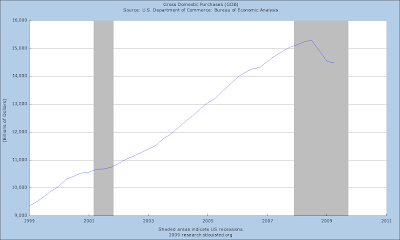 Bill Gross: Fed on hold through 2010 — Pimco's Bill Gross apparently expects that unless we can sustain 5-6% nominal GDP growth over the coming years (a rate the economy is geared for) then debt deflation is likely to take hold. Unless I am misinterpreting these remarks, this is ominous, as true debt deflation dynamics would likely lead to an economy no one could deny was in depression. What Stinkin' Inflation? 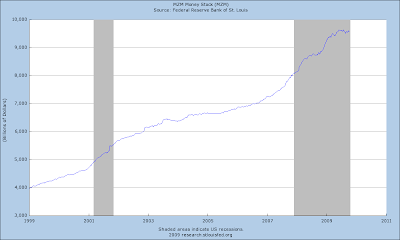 PPI Edition — Breaks down the PPI changes in a useful graph. Food and energy increases dominated in October. Nouriel Roubini, One on One: More Doom and Gloom — "Well in commodities, I look at oil prices. They fell from $145 last summer, came down to $30 earlier this year and now they’re back close to $80. 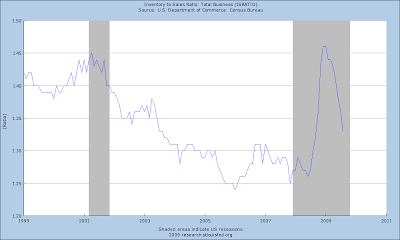 But if I look at the fundamentals of demand and supply, demand is down to 2005 levels, supply and inventories are at all-time highs. In my view, the movement in oil prices is not fully justified by the fundamentals." Pig Farmers are Making Brent Nervous — on "pervasive" hoarding of metals by private speculators throughout China. Goldman’s Global Oil Scam Passes the 50 Madoff Mark — On the ability of financial speculation in futures to drive commodity prices (the focus here was on oil). Commodity inflation — James Hamilton asks "Why are the prices of so many commodities rising in an economy that seems to remain quite weak?" "On a seasonally adjusted basis, the Consumer Price Index for All Urban Consumers (CPI-U) rose 0.3 percent in October, the U.S. Bureau of Labor Statistics reported today. The index has decreased 0.2 percent over the last 12 months on a not seasonally adjusted basis. 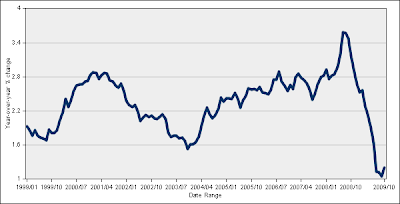 The seasonally adjusted all items increase largely reflected advances in the indexes for energy and for new and used motor vehicles. 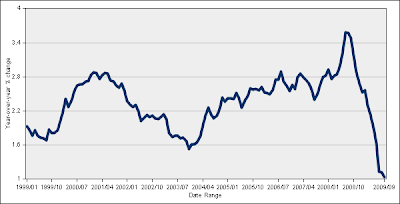 The energy index rose for the fifth time in the last six months, advancing 1.5 percent as the indexes for gasoline, fuel oil, natural gas, and electricity all increased. The index for all items less food and energy rose 0.2 percent in October, the same increase as in September. The indexes for used cars and trucks and for new vehicles both rose sharply and together they accounted for over 90 percent of the increase in the index for all items less food and energy. The indexes for airline fares and medical care also increased, while the shelter index was unchanged and the indexes for apparel and recreation declined. The food index also increased in October, rising 0.1 percent after declining in two of the previous three months. The index for food away from home increased slightly, while the food at home index was unchanged. Within the food at home group, the index for dairy and related products rose significantly, while the fruits and vegetables index declined for the fourth straight month." The above chart shows the rate of change (over a sliding three month period) of the components whose absolute price levels are shown in the previous chart. I also added the magenta line for shelter (even though it is contained within the yellow housing measure) to better show the effect of declining rents and owners' equivalent rents separated from other housing components such as energy. I added "Finished goods less food and energy" starting this month. It shows marked disinflation (and deflation for October, but that could be a blip for now). 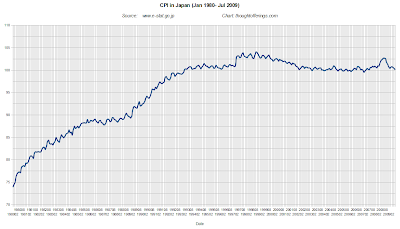 The peak of Japan's CPI occurred in October 1998, almost eight years after the stock market peaked, and Japan's notorious mild deflation has been in effect since then. A multi-year disinflation (of core CPI) leading to sustained mild deflation is one possible outcome for the US. The measures I've been showing here recently haven't changed significantly this month, so I'm going to skip updating them this time. I'll bring them back when there are noteworthy directional changes. A greater amount of government stimulus applied by Japan to maintain aggregate demand. Japan's post-asset-bubble balance sheet recession occurring in the context of a booming global economy, which would support demand for Japan's output via strong exports to the rest of the world, as well as put a floor under commodity prices. 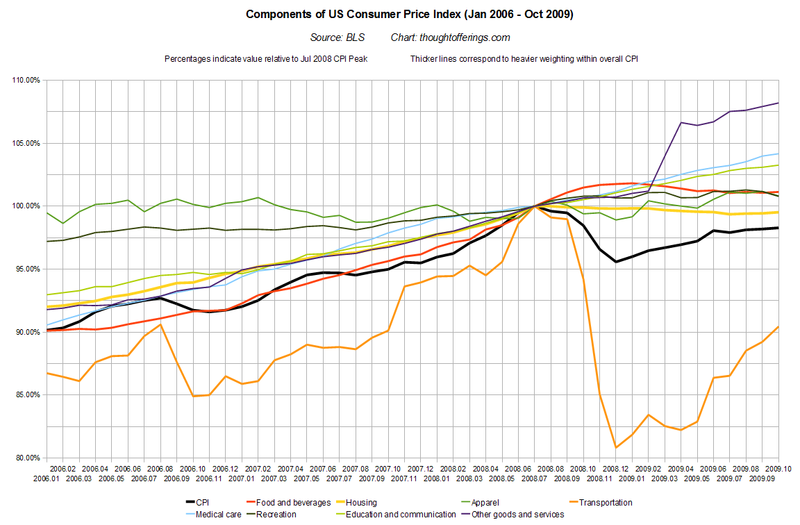 Consumer prices in modern economies potentially much "stickier" than was the case in the 1930s, due to a larger share of complex goods in our typical consumption "basket", plus a large services sector, neither of which seem likely to be dragged down rapidly by falling commodity prices. 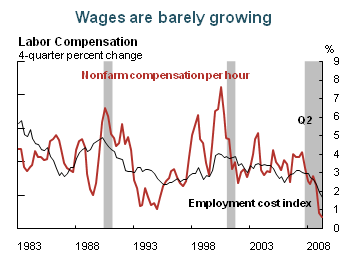 (Labor prices are are generally not renegotiated daily like commodity prices). If accurate, this could suggest modern economies are less likely to enter the vicious spiral of self-reinforcing deflation. 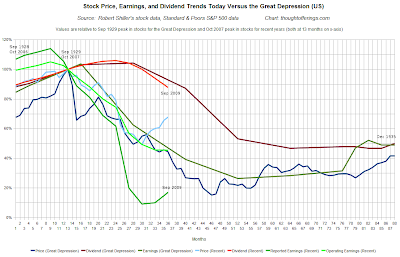 Larger upward inflationary momentum at the time of the asset bubble burst. 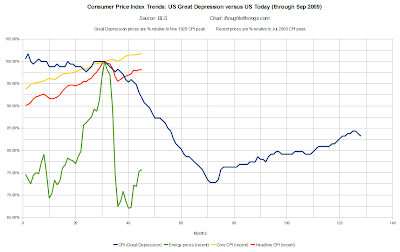 In the US, when the stock market and credit bubbles started bursting in 1929, three out of four CPI components were already in mild to moderate deflation. Japan had roughly 3% inflation at the time of the stock market bubble peak and it was almost eight years before the consumer price level peaked. I initially attempted to include China's data, but only year over year changes are provided for each month, so there is insufficient data to reverse-engineer back to the raw price level data. 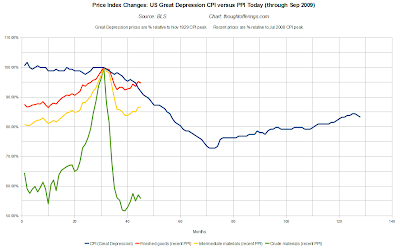 The US CPI has been the most volatile — the fastest rate of increase leading up to summer 2008 (excepting Iceland), and the most rapid deflation in the second half of 2008. Perhaps this reflects a greater CPI weighting to energy than the other countries. Iceland's price level inflation has been so dramatic relative to other countries that rather than show the full climb (from 87% to 118%), I zoomed in the chart to make the differences between other countries more visible. I'm not sure to what extent this inflation was driven by falling currency exchange rate versus other factors. Spain and Ireland (but especially Ireland) appear to be in the strongest deflationary trend among European countries included here. Spain and Japan have tracked closely to Ireland since mid 2008, but are in 2009 showing a little more price level stabilization than Ireland. 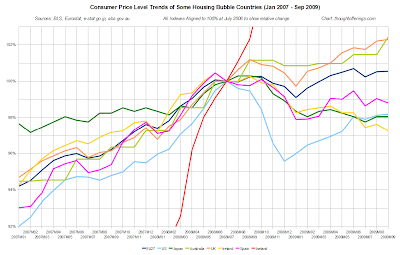 The UK and Australia each paused in their price level ascent in the second half of 2008, but their prices have marched higher again in 2009. Probably not coincidentally, both countries have seen housing prices rebound and set new highs (I have read this but not confirmed the data). 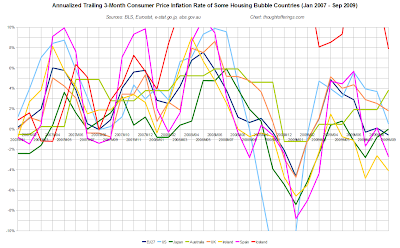 The next two charts show the annualized trailing three month inflation rate for each country. The charts are identical other than the Y-axis scale — the second shows the data in full, while the first is zoomed in, excluding most of Iceland's data points, to better see differences in the other inflation rates. Note these are probably extra volatile because many of the data series are not seasonally adjusted. All the countries except Iceland experienced a dramatic decline in inflation at the end of 2008. Even the least affected, Australia, still had a negative three month annualized inflation rate lasting three months. This is very likely the result of global commodity price declines in the second half of 2008, underscoring that some price level influences truly are global. Iceland's inflation rate soared in early 2008 and has been declining ever since. It is still the highest rate of the countries I've shown, at 8% (July-September 2009, annualized), but has been dis-inflating rapidly from a peak three month annualized rate of around 30%. I have wondered whether at some point Iceland could fall into deflation, since at least a couple years ago its domestic credit levels looked quite high relative to GDP. I don't know what the domestic debt dynamics are currently and perhaps the dynamics of a huge external debt level contribute more substantially to macroeconomic developments. Only Australia has had a three month annualized inflation rate that has climbed consistently through 2009 (September is the latest data). The UK diverges from Australia with its three month inflation rate declining since April 2009 (but it did increase faster at the start of 2009). Excluding Iceland, the most recent data point, September 2009, shows a range from around 4% inflation (three month annualized) in Australia down to around -4% inflation (i.e., deflation) in Ireland. 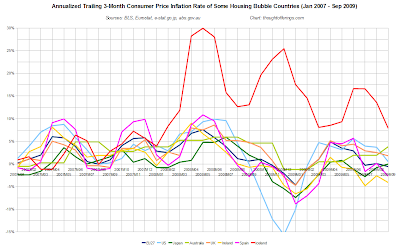 This was a very rough high-level look at relative price level trends and short term inflation rates over a sampling of housing bubble countries and other countries of interest (Japan, Iceland). More insights would be likely with additional analysis such as adjusting for exchange rate trends, comparing rates of government deficit spending, comparing changes in private debt levels, etc. The price level trends across countries show some correlation at times (e.g., late 2008), suggesting global macroeconomic factors matter to some degree, but also diverge significantly at other times (e.g., the current -4% to 8% range of 3-month annualized inflation across countries), suggesting domestic country-specific dynamics are the dominant factors in price level trends, even at times of global recession/crisis. There are at least three key domestic dynamics that could be most heavily influencing price levels. 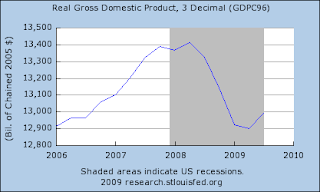 One is the degree of government stimulus relative to the contraction in private spending. 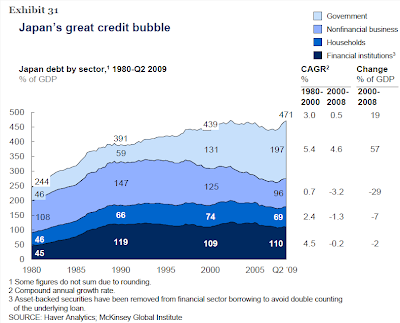 A second is whether private debt bubbles have actually popped or are still growing. A third would be the relative size of these debt bubbles (total debt-to-GDP) and their recent rate of growth (since added debt contributes to annual aggregate demand). I have not included enough data in this post to evaluate these factors for each country. But at the risk of being wrong, my current assumption is that size of government response is the number one differentiating factor, and some countries are maintaining a stronger private-sector bubble mentality than others (e.g., with respect to Australia's housing prices). If government stimulus proves politically unsustainable, or private sector debt bubbles collapse and prove to be overpowering, it could be that countries like Australia will simply lag countries like Ireland with respect to consumer price deflation. Ireland may be the country to watch — I've seen suggested that it may have begun a full scale debt deflation. Note that different countries construct their CPI measures differently, so some trend differences likely reflect what each country considers a representative "basket" of goods and services. Also the US, UK, Ireland, Spain, Iceland, and Euro 27 price levels are not seasonally adjusted. I think the data I found for Japan's and Australia's are seasonally adjusted, but I am not certain. 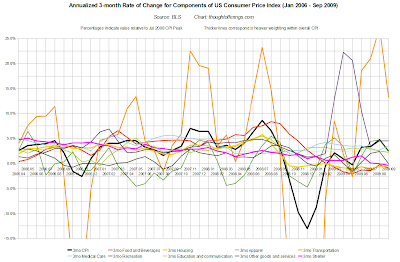 The reason I like looking at absolute price level trends right now rather than just rate of change (typically year-over-year) is that when price levels are not moving in a single direction (until the recent deflationary trends, the direction of CPI indexes was primarily up), then the year over year change only incorporates two data points at a time, and is therefore especially volatile and doesn't reveal the big picture as well. 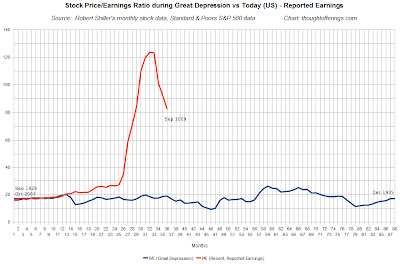 This post updates the charts from Price Deflation Today versus the Great Depression and Post-1990 Japan — Comparative Charts (which had data through July) and the August data update with the data for September. The original post contains the most in depth discussion of the comparisons between the three episodes, so please look at that if you have not already. 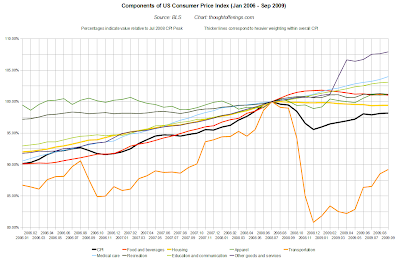 My current plan is to update this post each month after PPI and CPI data is released as long as the comparisons remain interesting. "With home prices crashing year-over-year and both housing rents and apartment rents dropping as well one might think that falling rents would be reflected in the CPI." Mish subsequently looks at the September CPI data in Year-Over-Year CPI Negative 7th Consecutive Month; Rents Decline First Time In 17 Years. "Anyone analyzing the tax credit should call the economists at the BLS and ask about how falling rents will impact owners' equivalent rent and CPI. Then call the economists at the Federal Reserve and ask how CPI deflation will impact consumer behavior and monetary policy. Welcome to the Fed's nightmare." "However, the expenditure weight in the CPI for rental equivalence is obtained by directly asking sampled owner households the following question: If someone were to rent your home today, how much do you think it would rent for monthly, unfurnished and without utilities?" "It seems that there may be another explanation, and that is stockpiling by private investors. From what I am being told, it seems that a number of wealthy Chinese investors have been speculating directly in commodities, and so some of this inventory buildup is occurring not at the company level but at the investor level." The potential for a sharp drop in commodity imports by China (if this inventory build is accurate and if it turns out to not be sustainable and if real demand doesn't catch up quickly) is one of the reasons, even if the odds could be small, that I believe there could at some point be another commodity price "crash" similar to the second half of 2008. Those are a lot of "if"s, and they are not the only factors involved. But if commodity prices crashed in the context of other CPI components already in mild decline (food and shelter in particular have moved in this direction recently), then unlike in 2008 in which inflation in many CPI components was still high, the conditions would be more similar to the starting conditions of the self-reinforcing deflationary spiral during the Great Depression. 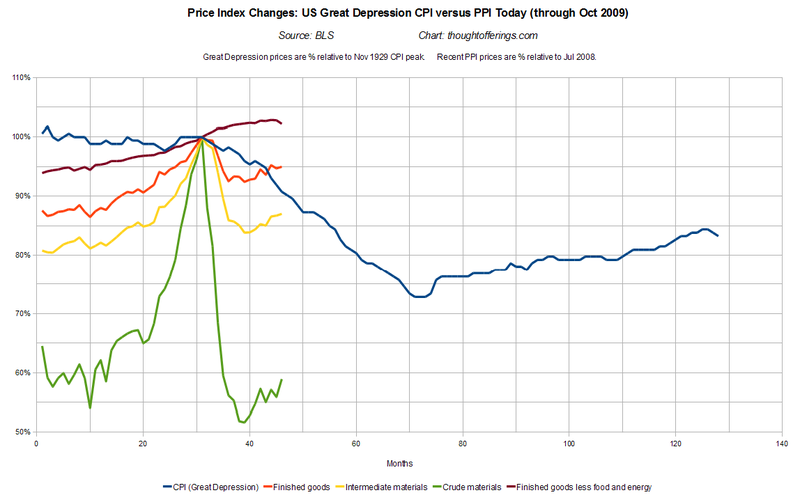 To recap the 1930s experience, look at the Great Depression CPI Components chart later in this post (and past posts) — in 1929, before CPI started dropping rapidly, only food prices were in a rising trend — everything else was already declining. 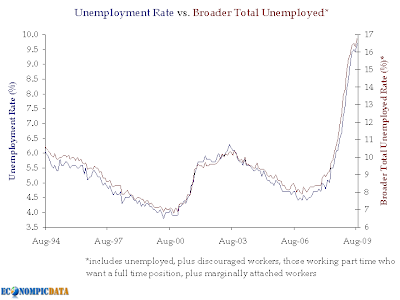 "An interpretation of these data is that the September CPI increase was anything but broad-based. 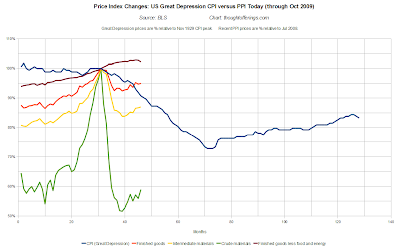 Moreover, the data seem consistent with the idea that prices overall are on a path of disinflation." I'll start including a trimmed CPI chart with the others (below). "On a seasonally adjusted basis, the Consumer Price Index for All Urban Consumers (CPI-U) rose 0.2 percent in September, the Bureau of Labor Statistics reported today. The increase was less than the 0.4 percent rise in August. The index has decreased 1.3 percent over the last 12 months on a not seasonally adjusted basis. The seasonally adjusted increase in the all items index was broad based, although tempered by a decline in the food index. The all items less food and energy index increased 0.2 percent in September after increasing 0.1 percent in each of the previous two months. Contributing to this increase were advances in the indexes for lodging away from home, medical care, new vehicles, used cars and trucks, and public transportation. The increase occurred despite declines in the indexes for rent and owners’ equivalent rent, the first decreases in those indexes since 1992. 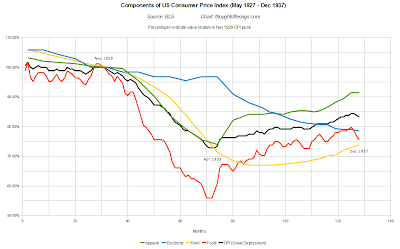 The energy index also increased in September, as increases in the indexes for gasoline, fuel oil and electricity more than offset a decline in the index for natural gas. In contrast to these increases, the food index declined, falling for the sixth time in the last eight months. The index for food away from home increased, but the food at home index declined as the indexes for fruits and vegetables and for meats, poultry, fish and eggs fell sharply. Both the food and energy indexes have declined over the past 12 months. The decline in the food index is the first 12-month decrease in that index in over 40 years." The annualized 3-month rate of change chart is new for this month. Despite being cluttered with too many lines (sorry), it does give a better sense for the rate of change of the components whose absolute price levels are shown in the previous chart. Most components are flat or down as of the three month last period. I also added the magenta line for shelter (even though it is contained within the yellow housing measure) to better show the effect of declining rents and owners' equivalent rents separated from other housing components such as energy. 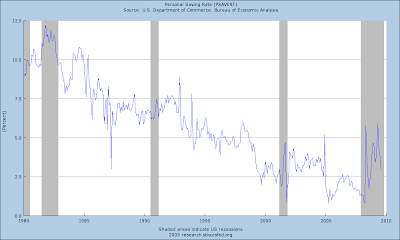 Shelter has been in a remarkably consistent disinflation and has just turned negative. This is a partial selection of measurable forces that contribute toward price deflation, though the core cause is the bursting of debt-financed asset price bubbles. Not all of these measures are in an outright deflationary trend, but most are suggesting at least disinflation. This data is US-specific, but US price levels will also be affected by global trends in the months and years ahead, for example with respect to whether China and other emerging economies falter meaningfully in their growth. I have kept the same set of charts even though same data updates are quarterly not monthly and as such some charts are the same as last time. No commentary on these for now — perhaps in the future. For the last couple years there has been a lot of discussion of how the macroeconomic situation in the US compares to past historical episodes. 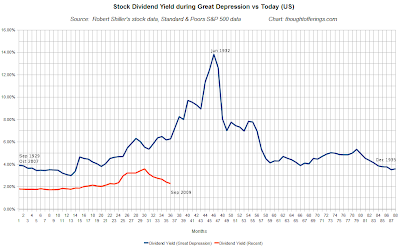 Unfortunately the discussion of debt levels has relied mostly on anecdotal data, other than the one well covered comparison of the US today with the US at the time of the Great Depression (see for example Steve Keen's charts here). I'm among those who view post-1990 Japan as a highly relevant additional example. A few months ago I finally found what I hope is reliable debt data for Japan. 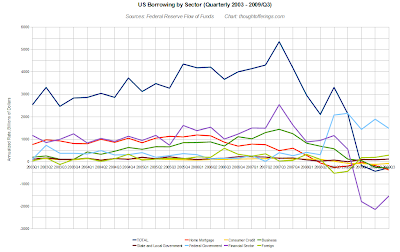 I'll present charts of the data first but please read the sourcing methodology further down as it's possible this method of measuring of Japanese debt may not be an apples-to-apples comparison with the US Federal Reserve's debt data (please give feedback if you have it, and I will update the post). 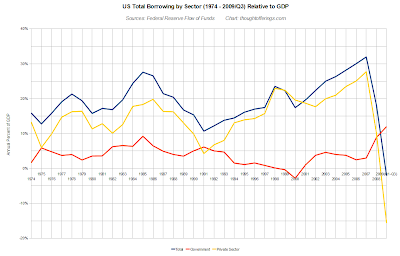 The next chart shows the debt-to-GDP ratios since 1980 — i.e., factoring in the impact of economic growth (as measured by GDP) reducing the debt burden relative to incomes. 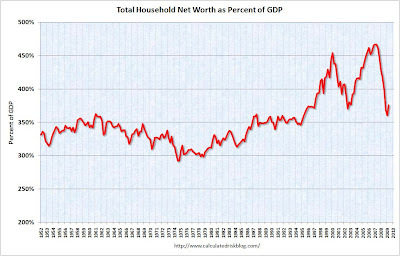 By this measure, total private debt-to-GDP did peak around 1990 when stock and real estate bubbles were bursting. This suggests that in the context of a booming global export market and by continuing to increase its debt, Japan was able to keep growing for years after its asset bubbles burst. 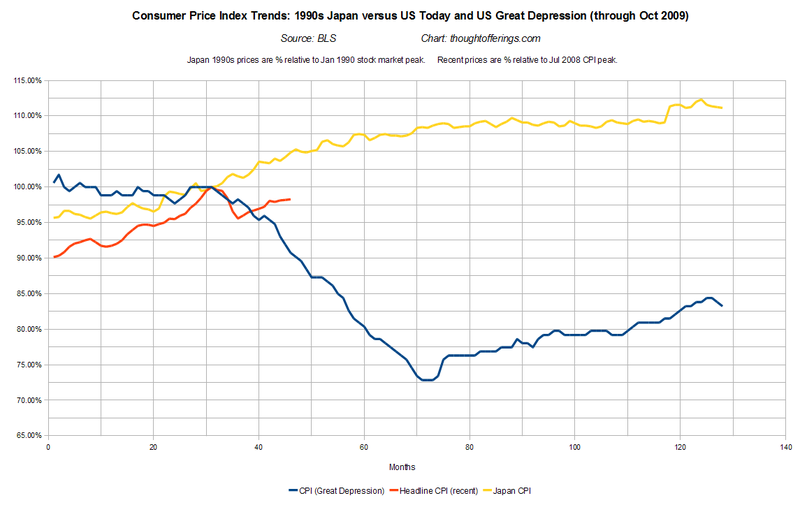 Interestingly the 1997-1998 time-frame is also when Japan's consumer price levels peaked (see chart here). 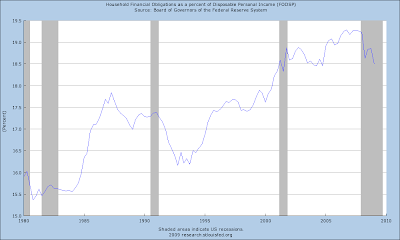 Confirming anecdotal experience, the corporate sector was highly leveraged (much more so than the household sector), and did work on reducing debt but most notably so after 1997. 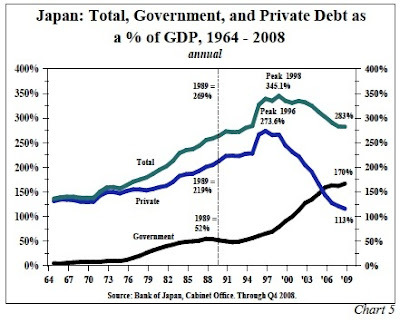 But the most striking insight this data yields is that Japan's economy from 1990 until 2005 did not deleverage on aggregate, due to the government increasing debt faster than the private sector was reducing debt, and that the private sector has only reduced debt from 386% of GDP (1990) to 328% of GDP (2007)! This government borrowing most likely explains why Japan did not experience a depression (and is somewhat consistent with the views of Richard Koo, who I have discussed before). 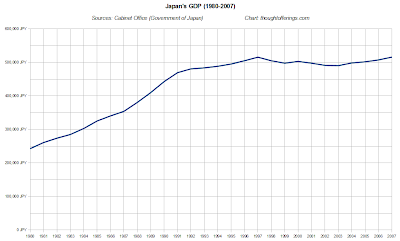 But it reinforces the question of what the end-game is for Japan and whether it will ever be able to grow out of or pay down its massive total debt. 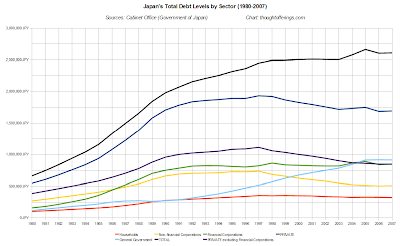 I played with the Japanese Cabinet Office data I obtained for this post by excluding loan-based debt, excluding non-loan debt, excluding financial sector debt, etc and no matter what combination I tried I was unable to generate a chart that looked like this one. 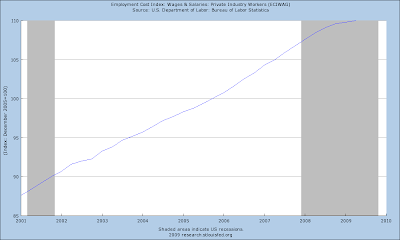 So one of the charts is probably wrong and it could be mine. This article by Andy Xie, What We Can Learn as Japan's Economy Sinks, is very worthwhile reading on Japan's crisis and more (though there are a few things I'm not sure I agree with). 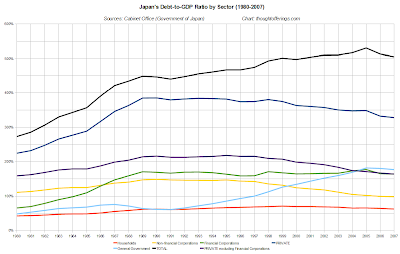 The debt levels he cites for Japan differ a bit from what I derived, for example, he says "total indebtedness of Japan's non-financial sector is 443 percent -- probably the highest in the world, and far higher than the 240 percent in the United States." Household debt was much higher in the US in 2007 than past episodes, but Japan had much higher corporate debt and somewhat higher financial sector debt. Government debt was fairly comparable. 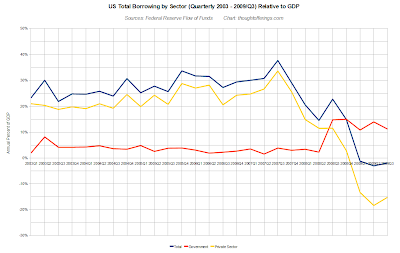 The chart's debt-to-GDP numbers are in this table. 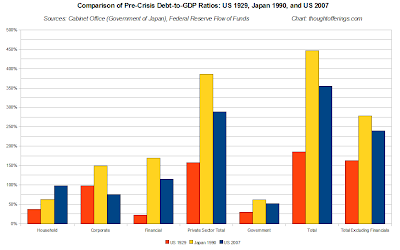 In one respect this is a mildly optimistic outcome in relative terms — contrary to past claims (by me included), Japan's debt crisis is not dwarfed by the current US debt crisis. 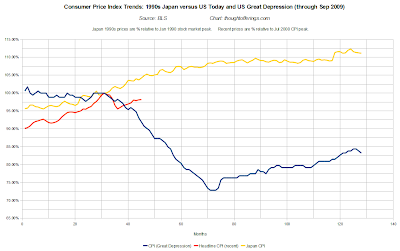 Depending on the US's political willingness to provide ongoing fiscal stimulus as Japan did, my opinion is this makes the Japanese style stagnation and mild deflation relatively more likely in the US, as opposed to a deep depression — though employment and GDP have already fallen more than they ever did in Japan (at least until this global crisis hit). 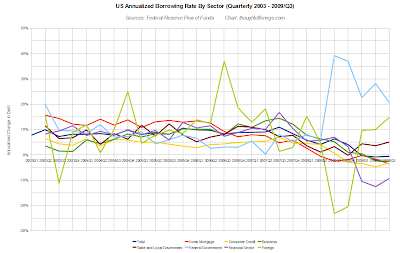 Of course, total debt-to-GDP is not the only macroeconomic determinant that matters, so other factors could drive the US today to a different outcome. 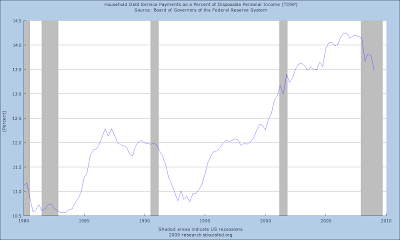 Substantially higher household debt, especially with non-recourse mortgages standard in the US, could be a much more negative factor relative to Japan. There are far more distressed household balance sheets than corporate ones given the relative number of entities in each sector, so this could increase the system's susceptibility to full-blown debt deflation, especially given that households have less incentive to "extend and pretend" by faking solvency through relaxed accounting rules than corporations do. The global context today is that most nations in the world have been involved in this crisis, many of them with high debt levels of their own. This probably explains in part why the current crisis has been deeper than Japan's post-1990, but the question remains whether this crisis is winding down or whether deflation will intensify and cause even deeper economic pain in the years ahead. 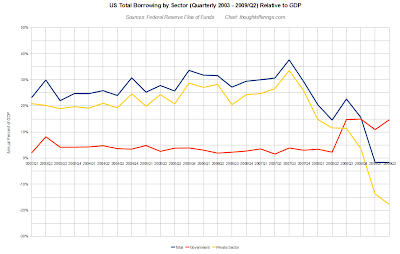 With deleveraging barely having begun, there is strong reason to believe that we have years of adjustment still ahead. Other differences in financial markets today such as the huge global derivatives market and associated counterparty risks could be relevant. Many people summarize the options for removing excessive debt as inflate or default. While the long term result is uncertain, Japan has been carving a third option for nearly the last two decades — reduce nominal interest rates to very low levels to reduce the debt servicing burden while leaving the debt in place in an attempt to grow out of it, even if doing so is accompanied by economic stagnation. Note that this approach does not seem to cure insolvency, except perhaps through the long and slow process of using earnings for balance sheet repair. No doubt demographics are different in Japan compared to other countries and this has some impact, but the US and Europe are also increasingly facing aging populations. "Securities other than shares consist of bills, bonds, certificates of deposit, commercial paper, debentures, and similar instruments normally traded in the financial markets." "Credit market borrowing or lending is defined here as the transfer of funds through certain financial instruments: open market paper, Treasury and agency securities, municipal securities, corporate and foreign bonds, bank loans not elsewhere classified, other loans and advances (such as loans made under various federal programs), mortgages, and consumer credit. Excluded from the definition are a number of other items that are also sources and uses of funds for the sectors — official reserves, special drawing rights certificates, Treasury currency, deposits and interbank items, security repurchase agreements, corporate equities, mutual fund and money market mutual fund shares, trade credit, security credit, life insurance and pension fund reserves, business taxes payable, investment in bank personal trusts, proprietors’ equity in noncorporate business, and miscellaneous items; a sector’s credit market borrowing is thus not the same as the increase in its total liabilities." It seems quite possible, especially for the financial sector, that the "securities other than shares" contain types of debt that are excluded from the US debt measures (for example, perhaps certificates of deposit). PLEASE TELL ME IF YOU KNOW WHETHER THESE MEASURES ARE COMPARABLE. 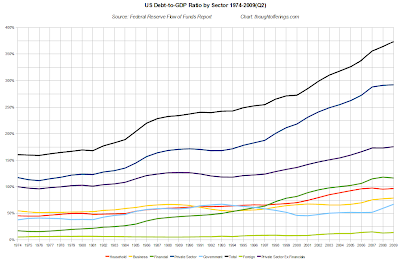 I did compare this data to a few individual data points I was able to find on Japan's sector-specific debt levels around 1990, and this data appears to be in line with those data points. The main unconfirmed data is Japan's financial sector for which I have found no other data points to compare. It's not clear whether the private sector measure includes the financial sector, but if it does, Sweden's debt levels were much smaller than Japan's in 1990 or the US in 2007. 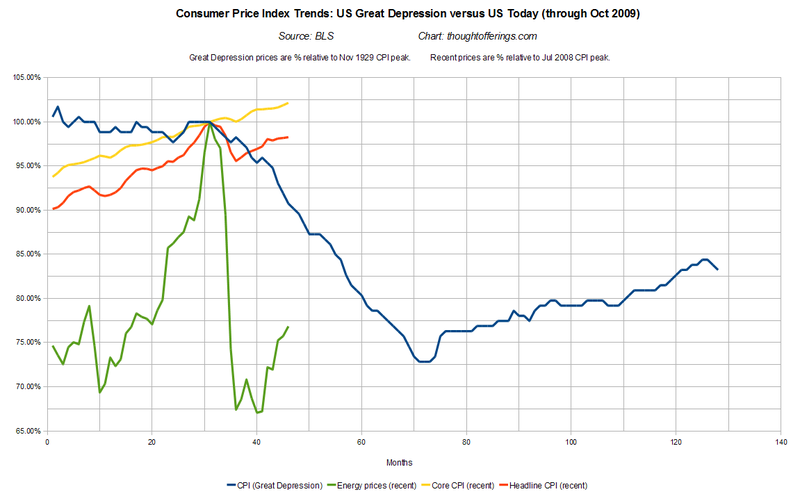 However, they were more comparable to the US at the start of the Great Depression. Yet like Japan, Sweden was able to grow exports to a booming global economy in the 1990s. So while the absolute debt-to-GDP measure is central, I don't believe it is the only important macroeconomic determinant. UPDATE 10/14/2009: I added a foreign debt row to the table of debt-to-GDP numbers (a commenter pointed out the numbers do not sum otherwise, so I probably shouldn't have skipped it in the first place). UPDATE 10/14/2009: After originally posting, I did seek input on the derivation of this Japan debt data from a highly financially-savvy blogger, and he replied that "yes" it was comparable to the US data (though I can't guarantee he looked at it in detail).